"Maximum suspense, unusual magic--a whole new, thrilling approach to fantasy "--Tamora Pierce, #1 New York Times bestselling author "A refreshing, powerful young adult fantasy." --Robin Hobb, New York Times bestselling author Powerful magic. A deadly legacy. A world at the edge of war.Prepare to be spellbound by The Black Witch.Evil looms on the horizon, and for Elloren Gardner, granddaughter of the last Black Witch, pressure to live up to her magical heritage is building. Elloren's people, the Gardnerians, believe she will follow in her grandmother's footsteps. But Elloren is utterly devoid of power--in a society that prizes magical ability above all else.Granted the opportunity to study at the prestigious Verpax University, Elloren sets out to embrace a destiny of her own, free from the shadow of her grandmother's legacy. But the university may be the most treacherous place of all for the granddaughter of the Black Witch, and Elloren soon realizes that the world she knows is not what it seems. If she is to survive the coming danger, she'll have to free her mind from the assumptions she was raised with, and learn to trust the very people she's been taught to hate and fear. 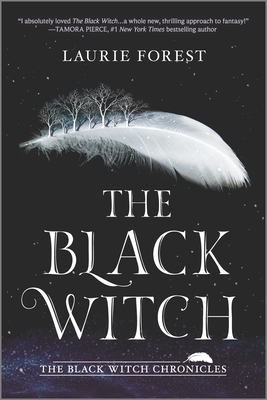 Critics are raving about Laurie Forest's incredible debut, The Black Witch "We fell under the spell of this rich, diverse, Potter-worthy university world "--Justine magazine "A captivating and stimulating fantasy novel with a whole world of excitement and danger. I thoroughly enjoyed getting lost in this world of magic and intrigue." --TeenReads.com "Forest uses a richly imagined magical world to offer an uncompromising condemnation of prejudice and injustice." --Booklist, starred review"Exquisite character work, an elaborate mythology, and a spectacularly rendered universe make this a noteworthy debut, which argues passionately against fascism and xenophobia." --Publishers Weekly, starred review"Briskly paced, tightly plotted...set in a rich alternative universe with a complicated history that can help us better understand our own." --Kirkus Reviews, starred review.